One of the parameters most currently used to assess milk thermal processes is Furosine (a product resulting from Maillard’s reaction). The method used to determine this parameter is however very expensive, requires a lot of time and the use of an HPLC system and, consequently, qualified personnel. CDR’s research laboratories have developed an innovative method that enables to determine the amount of powder milk added to raw and pasteurized milk and thus assess the effectiveness of the most commonly used thermal processes (pasteurization and UHT treatment). In this study, CDR has demonstrated that it is possible to determine the type of thermal process by measuring the concentration of e-Fruttosyl-Lysine, which is also produced during Maillard’s reaction. 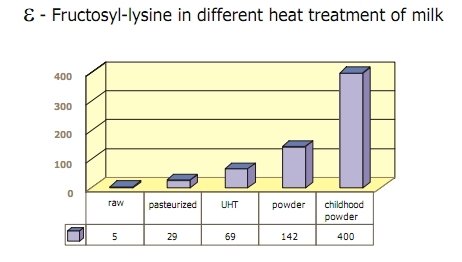 The content of e-fructosyl-lysine was measured in 5 milk samples that had been heated with different processes. Samples that had not been previously processed were tested using CDR Foodlab®. After an initial reaction of 5 minutes, researchers calculated the slope of the regression line. Data demonstrate an excellent correspondence between the content of e-fructosyl-lysine and the milk thermal processing. In addition, using CDR FoodLab®, the test is particularly simple to run because of the easiness of use and short testing time required by the system. F. Bonicolini, M. Bicchiega, from the biochemical laboratories CDR s.r.l., presented at Congrilait 2002 (26th IDF World Dairy Congress Paris, 24-27 September 2002) the results of the study. The relative poster is entitled Maillard reaction evaluation by e-fructosyl-lysine during milk thermal processing: first step. Assessment of Milk Thermal Processing Carried Out with CDR FoodLab® was last modified: May 3rd, 2017 by CDR s.r.l.